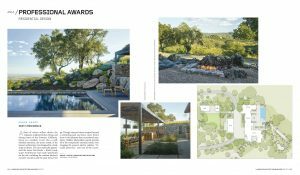 The American Society of Landscape Architects has awarded Roche+Roche a 2017 Residential Design Honor Award. The steep, wooded 17-acre site lies less than 2 miles north of the historic square and features stunning views over Sonoma Valley and across the Bay to San Francisco. The rural contemporary compound of buildings, designed by Cahill Studio Sonoma and built by Landers Curry, Inc., was sited to preserve and take best advantage of the existing oak woodland and volcanic rock outcroppings. The entire compound is off-grid, generating enough energy with hidden PV panels to power all on site electrical needs and charge the owner’s electric vehicles. The landscape, installed by Siteworks, Inc., features stone and gravel steps leading up to the top of the site, formerly a weedy, rock strewn knoll the clients thought they’d never venture to, where a destination with spectacular views was waiting to be uncovered. A gravel terrace with gas fire pit utilizing a dramatic existing volcanic rock as its backdrop overlooks a bocce court laid into a gap in the native rock outcroppings. The moon garden of light greens, grays and whites plays off the lichen color on the rocks, and gathers the evening light in the Valley of the Moon. You can find the full article in the September 2017 issue of Landscape Architecture Magazine or tour the landscape here.